Hello I found these strange looking pupae in my worm bin a few days ago, at first I thought that they were rats droppings wonder if you could help me identify the creature responsible curious to now what they are .Many thanks M.Parton. these creatures look very much like rat tailed maggots which are usually the offspring of certain Hoverflies. They usually like to live in stagnant water which is low in oxygen and high in organic content. I never had them in worm bins but found them occasionally in bins with lots of old and wet paper pulp. 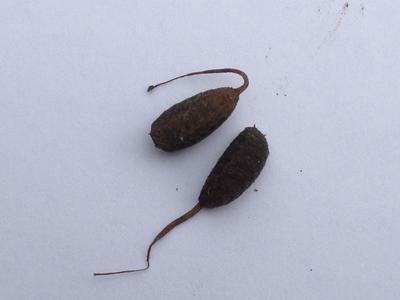 If you found them in your worm bin it might indicate that there are oxygen depleted areas in it with lots of moisture. So it might be a good idea to aerate it for a while and to reduce the moisture content. Kind regards and please keep us posted.